This 2 days itinerary in Kuala Lumpur is designed for visitors who are looking to explore the culture and heritage sites of Kuala Lumpur. 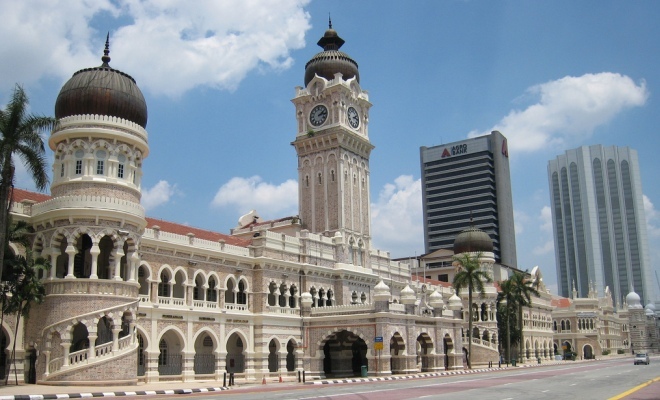 In this tour itinerary, you will be recommended to visit some of the notable historical buildings and century old temples in Kuala Lumpur. 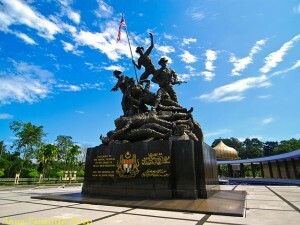 At the end of the tour, you should be able to back yourself with more indepth understanding about Malaysia’s history and culture. Arrives Kuala Lumpur in the morning and proceed to visit Islamic Arts Museum to learn about the Islamic historical background. The beautifully carved architecture and the wide collection of Islamic artifacts are some of the must see in this open museum. Spend at least 2 hours in the museum and enjoy Middle Eastern cuisines in the onsite restaurant. After lunch, proceed to visit the nearby National Mosque, continue your exploration about the Islamic culture and enjoy the peace and comfort atmosphere within the mosque. After an exciting exploration into 2 of the most important buildings backed with vast Islamic background, it is now time to expose yourself into Chinese culture. 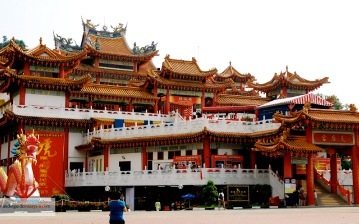 Thean Hou Temple is located at the top of a small hill near Mid Valley city and the colorful architecture and its serene surrounding are something that you must admire. The KL city view from the terraces of the temple is stunning and you definitely would not want to miss with some photo shooting here. After the Thean Hou Temple visit, you should now move to Chinatown in the city, not to visit another Chinese temple but to visit a century old Indian temple, the Sri Mahamariamman Temple. 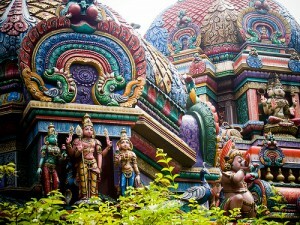 This South Indian temple was built in 1873 and one of the key attractions of this temple is the unique statues stand firm at the entrance. Enough for a long stare before moving into the temple for more interesting Indian statues and cultural stuffs. In the evening, have your dinner in one of the many restaurants in Chinatown, a good place to taste local cuisines and some street foods. After dinner, get yourself pampered with a round of body massage or foot reflexology, whether you are looking for traditional massage, Thai massage or Balinese massage, the option in Chinatown is endless. Back to hotel after a day of exciting culture exploration in Kuala Lumpur. 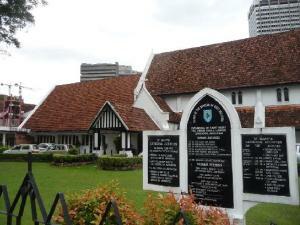 After breakfast in the hotel, kick off your culture and heritage exploration journey in Kuala Lumpur by visiting Merdeka Square, Sultan Abdul Samad Building, Tugu Negara (National Monument) and St Mary’s Cathedral. All of these places are located within close proximity between each other. After a visit to these notable and historical tourist spots, have your lunch in any of the nearby restaurants or cafes. In the afternoon, continue your trip by paying a visit to Rumah Penghulu Abu Seman, the residence (restored) of the late head of village Abu Seman. The visit is only allowed with a guided tour and no photography is permitted within the premise. During the tour, you will get the chance to see the interior of a Malay house and some of the historical background about Abu Seman. A good exposure into Malay community. This 2 days culture and heritage tour in KL ends after the visit to Rumah Penghulu. Full of luxury hotels, spas and shopping malls. Good for shopping, eateries and night entertainment. Massage parlors can be found easily. Backpackers paradise, scattered with budget and mid range accommodations. Good place to find good food too.